Hey, guys! 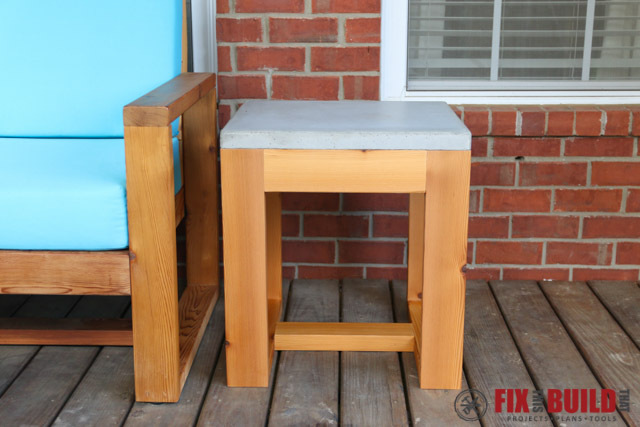 Today I’m going to show you how to make a DIY Outdoor Side Table. 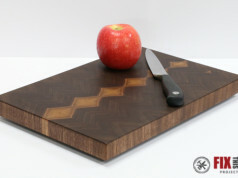 If you’ve got a limited tool set then this project is for you! 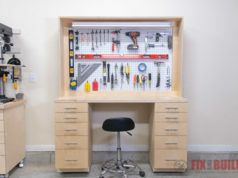 I only used two power tools (my RIDGID 18v Hammer Drill and 18v Circular Saw) and a hand full of basic tools to get the job done. 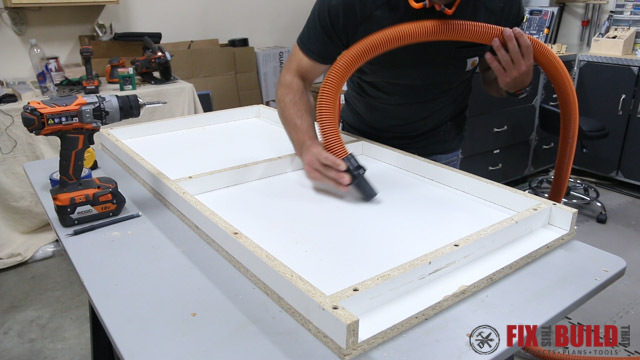 RIDGID is sponsoring this build and you can see their latest promotions at RIDGID Promotions Page. 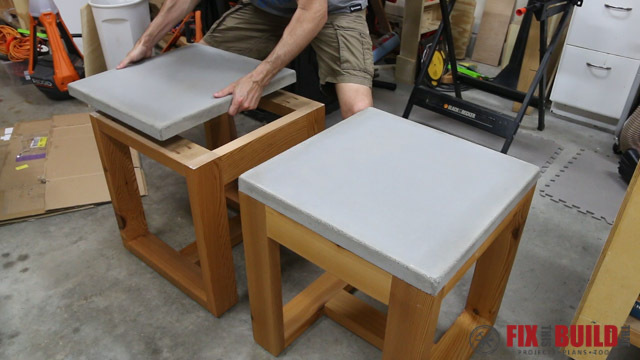 I only used two 2×4’s, and a bag of concrete for each side table along with a melamine shelf board to make the concrete form. And to top it off, I had my buddy Pete Sveen from DIY Pete here to help me with the whole process. 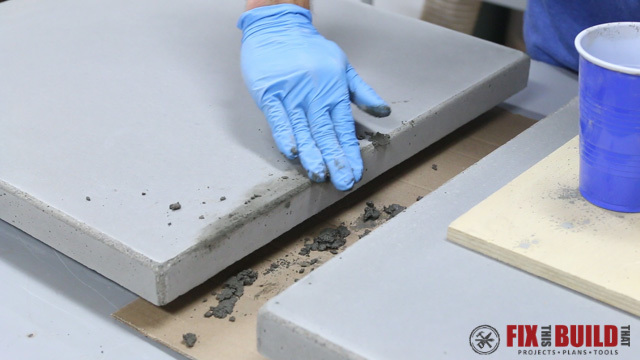 Pete was on a country-wide tour and is an avid concrete user so it was a perfect collaboration project. 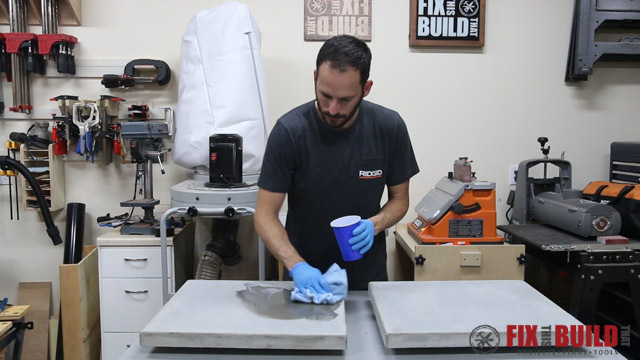 I also helped Pete make a walnut and concrete accent lamp which he posted on his channel so you can go check that out too when you get done with this one. 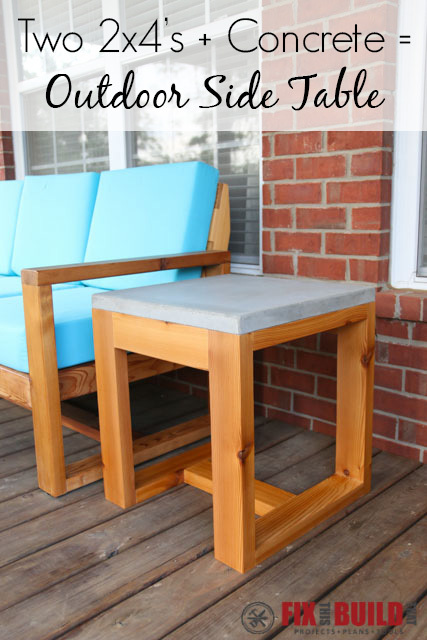 A DIY Outdoor Side Table is a great addition to any patio or deck so I hope you enjoy the build! Download FREE plans for it here. 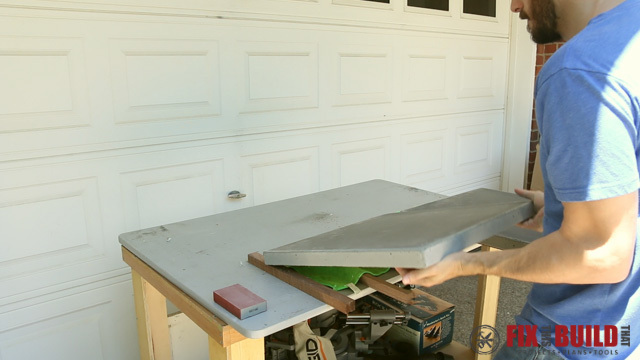 I started the build by making the forms for the concrete tops. 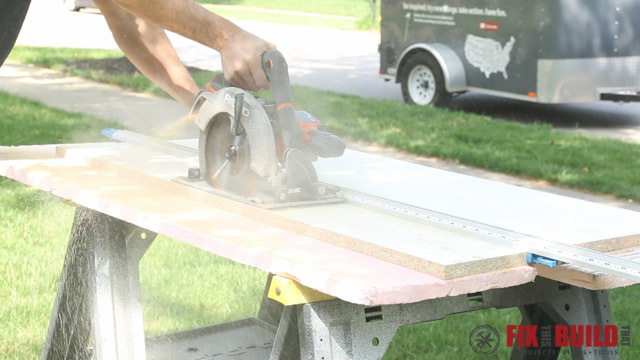 From a 2’x4′ piece of melamine I ripped four 1-1/2″ strips the full length of the sheet for the walls of the form. 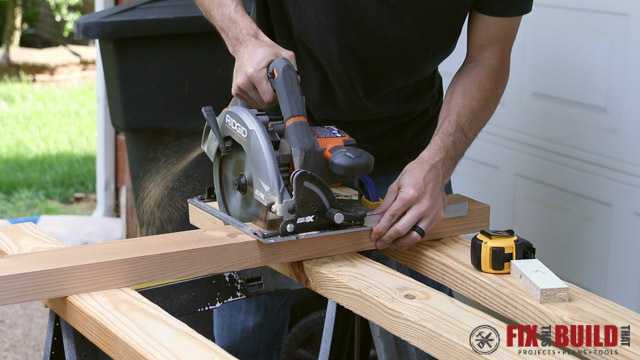 I used a 50″ edge guide to make straight cuts with the circular saw, but any straight edge or board clamped down will work. 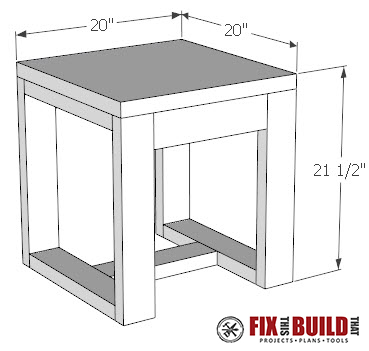 The 1-1/2″ width with become the thickness of the top when it’s formed. 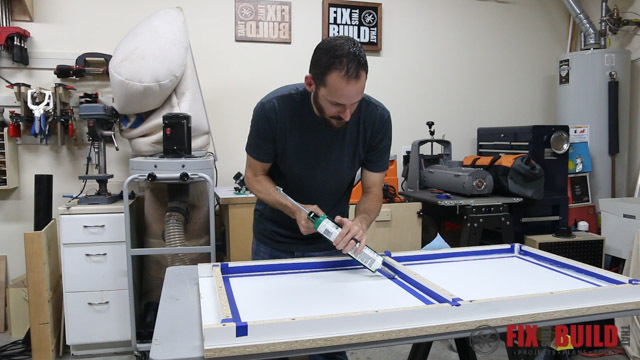 I cut two of the long strips in half then ganged together 3 of those shorter pieces and cut them to 20″ leaving me two long sides, two short sides and one divider. With the dusty part done Pete and I moved into the shop and started building the form for the concrete top of the DIY side tables. 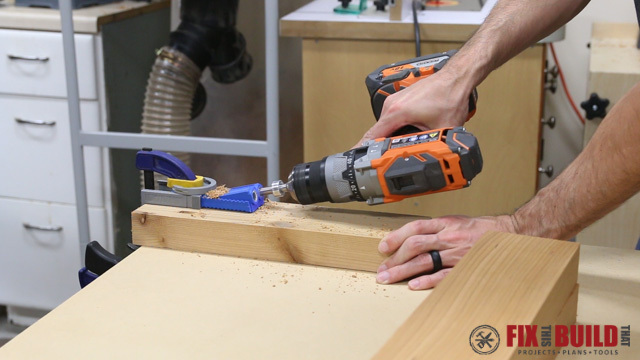 We used large piece of melamine left over as the base and clamped and screwed down one long side and one end using a countersink bit and 2″ screws. 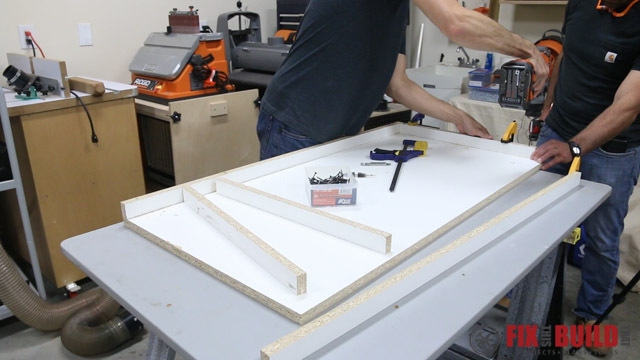 The tops are 20″ by 20″ so we measured in 20″ from the end and attached the center divider and another 20″ for the other end. Using a center divider to get two tops from one form makes things a lot easier when you vibrate and screed the concrete. 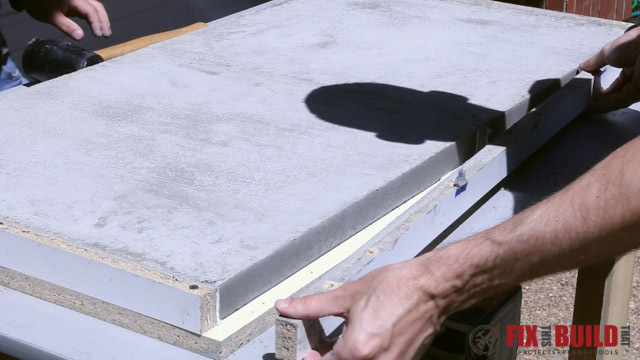 I used silicone to seal the corners of the concrete form and Pete showed me a cool trick to get a nice bead with no extra silicone on the sides. 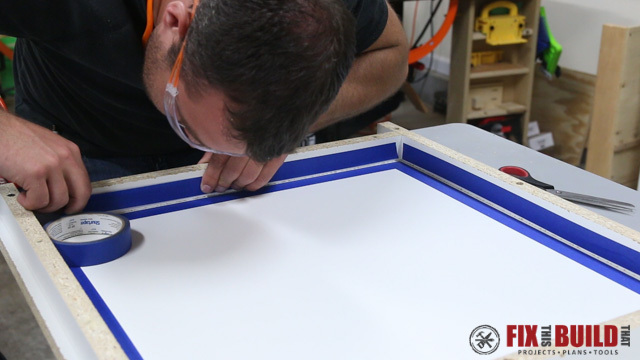 He used blue tape to mask off a channel 1/8″ out from the inner edges all around the form. Then I applied a bead of silicone caulk along the channel and smoothed it out with a wet finger. We removed the tape as soon as the bead was smoothed out then went back over the caulk with a wet finger to smooth out any little lips left from the tape. This was a cool little trick to make sure the caulk went exactly where I wanted and didn’t get all over the sides while smoothing. 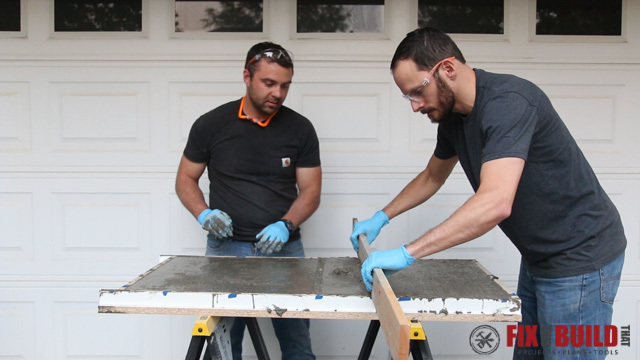 While the caulk was drying we went back outside to cut the parts for the base. 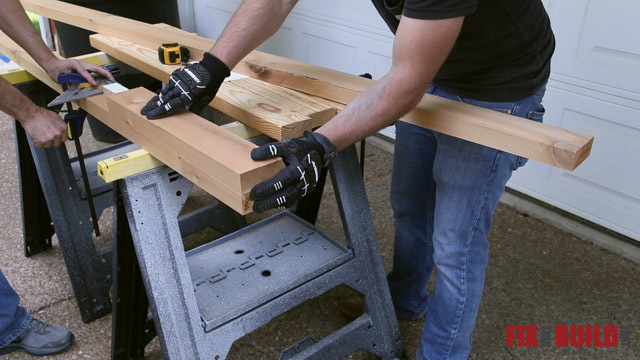 I’m using cedar 2×4’s from a local building supply store for the base. You don’t need a miter saw to get decent crosscuts, I made all these cuts with my circular saw. 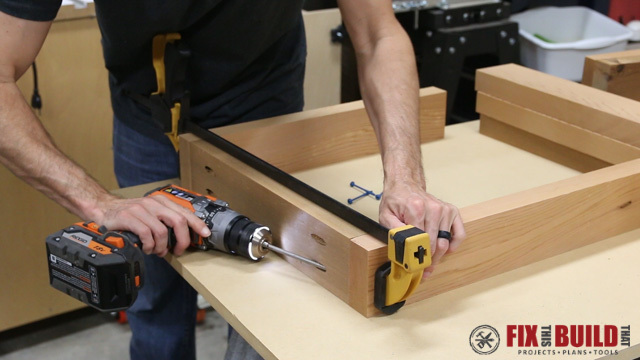 Just clamp a carpenter square to your board and use it to guide you for a 90 degree cut. Each base is made from just 11 boards: 4 vertical side pieces, 4 horizontal side piece and 3 stretchers which all come out of two 2×4’s. After cutting the first of each similar sized board we just laid that board back on top of the remaining 2×4 and butted it up against the end. Then I used a spacer to set my carpenters square in place. The spacer is the width between the outside edge of my circ saw and the outside edge of the blade. 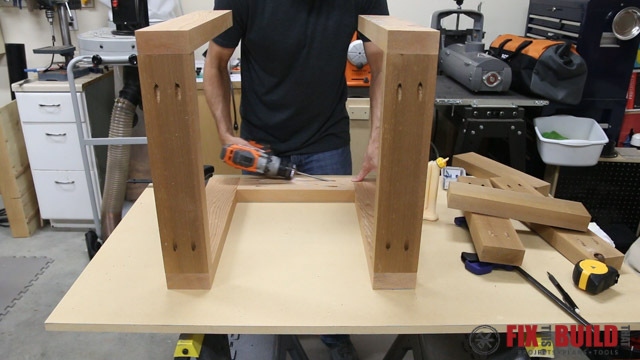 This makes short work of cutting down all the pieces. 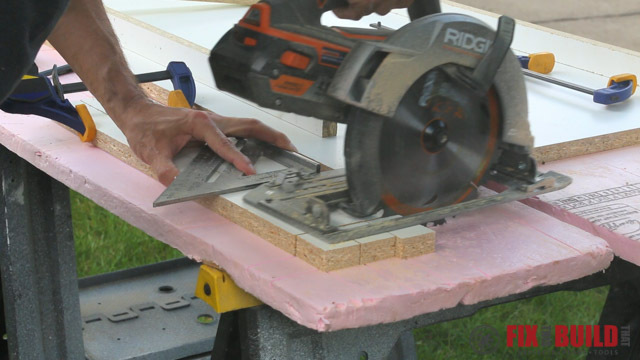 Just make sure you have proper support or a helping hand so the boards don’t bind or drop off and cause tearout at the end of the cuts. With the form ready to go we started mixing the concrete. And when I say we I mean, Pete. 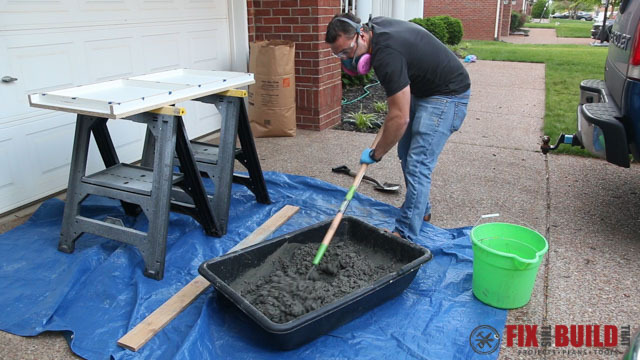 I’ve found the best way to mix concrete is to have someone else do it 🙂 Seriously though, Pete made this look much easier than my first go at it but I think the keys here are adding some water first, using a big enough mixing tub, and just adding water as needed until you get to a oatmealish consistency. We used a garden hoe which works great, but you can use a shovel to mix it too. I started transferring the mix from the tub to the form while Pete worked it into place, pushing it into the corners and edges and doing some vibrating of the form along the way. I used a scrap of wood to screed the surface, sawing it back and forth as Pete filled any voids exposed by the screeding. A 80lb bag was juuuuust slightly less than we needed so we did have to dip into a second bag, so two 60lb bags would be plenty. After doing a little more vibrating to get the air bubbles we set the form back inside to dry overnight. 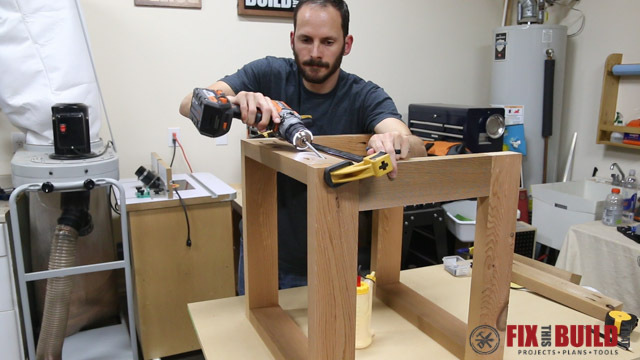 Keeping with the minimalist theme I decided to use a handheld pocket hole jig for the joints on the DIY outdoor side table. You can pick one up for $40 and while it’s a little slower than the larger model it gets the job done just as well. All the boards but the upright legs get pocket holes on each end. 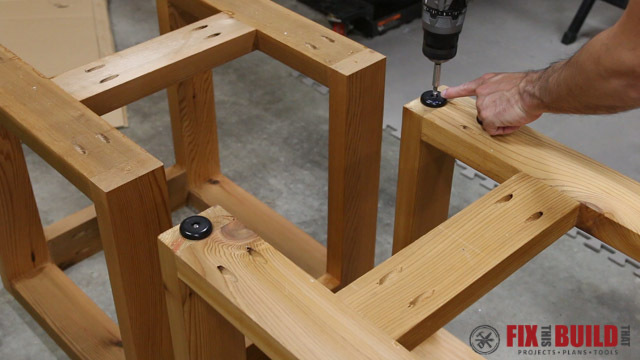 Assembly is very straight forward and goes quickly. 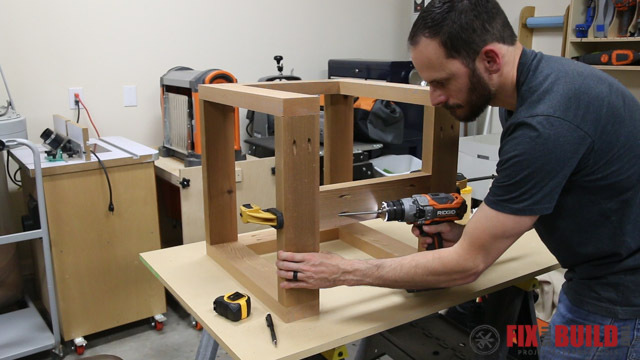 I used glue and 2-1/2″ exterior pocket screws for each joint and started by making two u-shaped assemblies which will be the sides without the tops pieces. Next I joined the sides of the DIY side table with a front and back stretcher clamping the boards firmly in place before securing them. Then I came back and added a top piece to the sides. 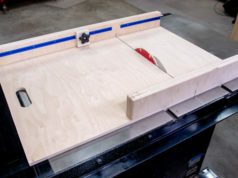 The tops would have gotten in the way of my drill while attaching the stretchers, so that’s why I added them afterwards. 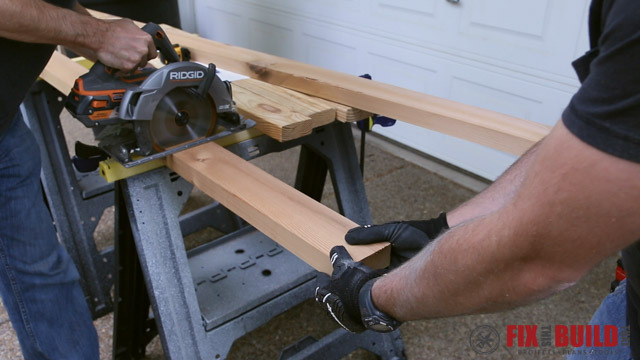 The last piece is a base stretcher which is centered between the sides and shores up the strength of the table. I sanded the whole base with 150 and 220 grit sandpaper. After sanding I applied 4 coats of an oil based outdoor spar urethane. 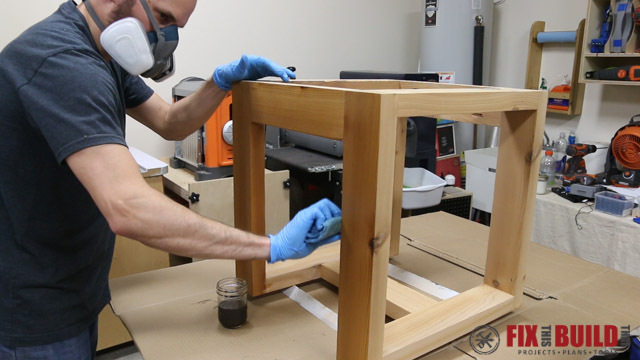 I thinned each coat with mineral spirits to make it easy to wipe on with a rag. The next morning Pete was back and we took the concrete out of the forms. We removed the sides and I sanded the edges with 120 grit to keep them from chipping. We were in a time crunch for Pete’s visit so we probably took these out a little early as you’ll see how wet the top was still. To help the tops dry a little faster we flipped them over onto some scrap pieces of wood to let the air flow all around the concrete. The corners and edges of the top had some voids in them from the form, so I used the leftover concrete to fill some of the holes and gaps. I used a collander to sift out the large aggregate from the mix and made a paste that I applied to the needed areas. 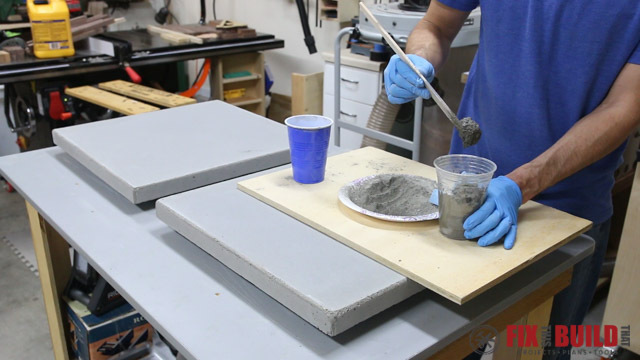 Last time I used portland cement to do this and I’d recommend going that route or using a finer sifter for your mix. This was a little harder to apply than I thought it would be. After the repairs dried I sanded everything lightly with 320 grit. Then I sealed the tops and sides with concrete sealer using a microfiber cloth. If you want to be extra careful then you can wait a full 28 days before applying the sealer for a full cure, but I left the bottom unsealed to allow for moisture transfer and further curing. I did the same thing on my DIY concrete top outdoor coffee table and it’s totally fine after 9 months. Before putting the tops on the bases I attached some rubber feet onto each table to keep them off the ground and any standing water. I used a dab of silicone at each corner and the top’s weight to hold them down to base. 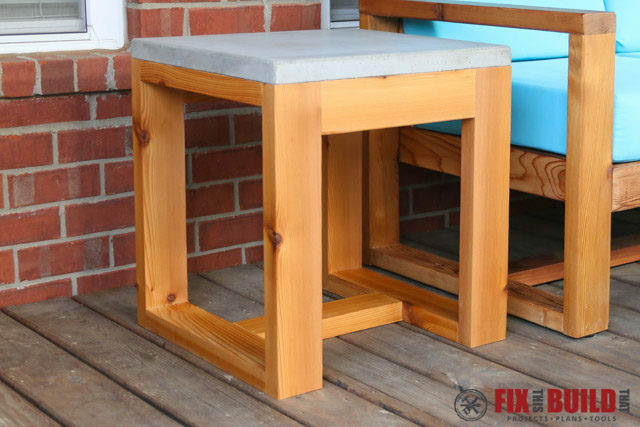 You can get plan for this DIY Outdoor Side Table using the link below. 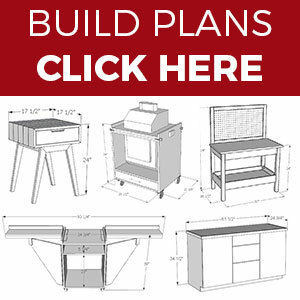 And check out the rest of my outdoor patio furniture builds on my Outdoor Furniture project page.